Even if you diet and exercise, it can be impossible to reduce fat on stubborn problem areas. Now it is possible to remove unwanted fat on the neck, jawline, arms, breasts, abdomen, thighs and knees with minimally invasive Smartlipo treatments. Laser liposuction is recommended for healthy individuals who are not significantly overweight, but who are tired of working hard, eating right and not seeing results. Smartlipo is a fast and permanent solution to stubborn fat that is minimally invasive and does not cause major side effects. The procedure uses a powerful laser to destroy excess fat cells below the skin’s surface. The laser liquefies fat cells and then permanently removes them from the area using suction. Simultaneously, Smartlipo laser body sculpting stimulates natural collagen and elastin production to tighten the surrounding skin tissues, allowing you to achieve amazing results without needing additional surgery. Unlike traditional liposuction, Smartlipo is minimally invasive and allows patients to remain awake during the procedure so that they can recover faster. Surgical liposuction removes large pockets of fat, but also leaves behind areas of extra skin that have to be removed with more surgery to achieve optimal results. With Smartlipo laser body sculpting, skin is also tightened in the area, producing a smoother and firmer result. Smartlipo laser liposuction uses local anesthesia to reduce discomfort and pain during the procedure. Some light trauma can occur, but since laser body sculpting is minimally invasive, patients can recover at home after the procedure. Most people can return to work within a few days and can return to exercising in about two weeks. Results will begin to appear within the following week and the best results seen in the next three to six months. 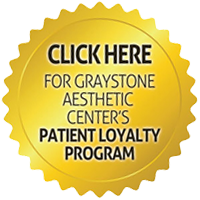 Call Graystone Aesthetic Center today to schedule a consultation and see what laser liposuction can do to sculpt your stubborn areas!